The Great Elephant Stampede in Texas. If someone told me that there had been a cattle stampede in Gonzales, Texas, I wouldn't doubt it one bit. But, elephants on the rampage? Yep, it's a fact; elephants did stampede in this town in 1949. In the 1940s and early 1950s, Gonzales was the winter quarters for the Dailey Brothers Circus and the land they occupied was on the southeast side of town. The main entrance was located near the intersection of St. Vincent and Fair streets. The local kids didn't have to wait for the circus to come to town; it was here all winter. Many of the youngsters would hang around the circus grounds seeking a glimpse of the animals and perhaps even getting some part-time work. According to old copies of The Gonzales Inquirer, the Dailey Brothers Circus was very important to the local economy. It was considered such an asset, that when the Daileys decided to relocate their winter quarters to Florida; city officials here became very concerned. Representatives from the Gonzales Chamber of Commerce flew to Florida and persuaded the Dailey boys to move the circus back to Gonzales. In one Inquirer article, the Daileys commented that they hadn't realized how much the Gonzales folks wanted them to stay and they were happy to move back. The circus employees seemed to get along okay with the local citizens and everything was going just fine until the day of "the stampede." The Gonzales Inquirer described the happenings of that day in the following article. Norma Davenport, daughter of the owners of the Dailey Bros. 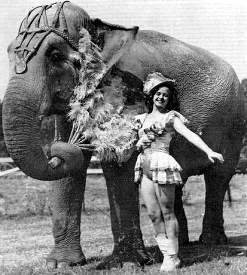 Circus - She was billed as the world's youngest elephant trainer, but her age wasn't given in the old programs. I would guess her age to be about 15. She is still alive and associated with a circus in Florida. She is in her 70s now. The elephant is "Jennie" - billed as the world's only talking elephant. Things are quiet at the Dailey Brothers circus lot, today, but for two hours late Tuesday, bedlam would have been tame by comparison. Eighteen bulls out of the circus herd of 21 elephants went on a rampage and stampeded out the winter quarters of the circus to roar across the southeast end of Gonzales for more than two hours before all were rounded up and corralled in their barn to quiet down. With the consent of owner Ben C. Davenport, the herd had been moved to a ravine at the far end of the old fair grounds to a heavily wooded section not far from the Guadalupe River. The animals had been arranged to pass in a group before the camera, but they were sluggish and refused to be speeded. Davenport dispatched two cowboys, mounted on horses, to the rear of the herd and allowed them to shoot several rounds from .44 caliber pistols. The combination of prancing horses and barking pistols frightened the herd and they started off without warning, trumpeting loudly and storming for distance in all directions. The herd, all but one - Little Butch - was safe before sunset. It was not until many hours later that Little Butch was located in the woods, six miles out, and brought home in Davenport's Cadillac. Two men were slightly hurt in the stampede, Rex Williams, 26, former Marine, a head elephant man with the circus, was bumped by a bull and sent flying probably 20 feet. He was cut and bruised. Raymond Freivogal, 30, utility man, who was in front of the herd, made a leap for safety and stumbled as the elephants advanced. He fell between two logs that had been rolled into place for props, and this proved to be the lucky accident that saved his life. The herd stormed over and past him, kicking the logs as it went by, but none tramped on Freivogal. He was bruised as the logs squeezed against him, and scratched by the bark, but was otherwise unhurt. For two miles, the elephants scattered, singly, in pairs and in threes, and it was more than two hours later - 4:30 p.m. - before the last was rounded up by the frantically laboring circus hands. They roared through fences knocking them down indiscriminately, and one bull tore off the porch of a small house. Letter boxes in the rural route areas also went down, among them the box of Louis H. School at State Park and one of his neighbors. Across the Gonzales-Shiner Highway, the herd flew, some of them being captured later against the brick walls of the Gonzales Cotton Mill. One pair suddenly smashed out of the brush land into the Shiner Road just as a tourist car, bearing Indiana plates and containing a middle-aged couple, drove along. The goggle-eyed man at the wheel nearly cracked up when he saw the elephants charging in his direction. He drove into a ditch and the elephants passed by. Later, when he was able to regain the highway, the tourist sped into town screaming that the elephants were after him. It was the first word in Gonzales that the elephants were on stampede. But the tourist fled the city.